"A group of scientists are doing experiments with hallucinogenic love drugs. 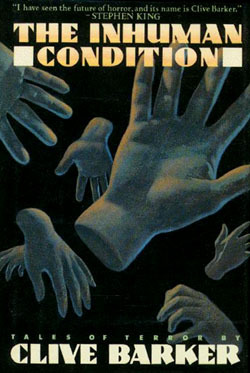 A victim of one such Aphrodisiac experiment runs away from the lab and soon things start to get very nasty..."
Totally "Weird Tales" material. 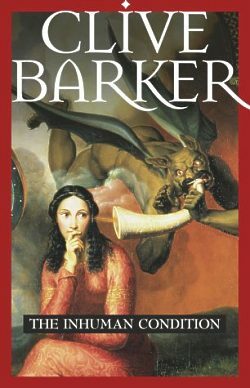 This story introduced me to Barker, and installed a healthy respect for that crazy writer. Something that Fritz Leiber wrote in good old days: an alienation of our body (starting with hands). "Charlie has the strangest thoughts. He thinks his hands are planning a revolt, plotting against him and the whole human race. Crazy, right? Well...when he wakes up to find that his hands have done, he's not so sure any more"
"A guy and his friends beat up a vagrant for fun, stealing from him a piece of knotted rope... That same day, the guy who took the knotted rope from the vagrant,begins to unravel it.With the unravelling of the rope his friends suddenly start to die out,one by one...And a lot of evil starts to be unleashed.The same vagrant whom was a victim has to help the guy battle this evil." A blockbuster for the senses, with a crazy monster-creation twist. "Jacquiline Ess: Her Will and Testament"
"New Murders In The Rue Morgue"
"A modern day ghost story with a small twist. An evangelsit and his troupe check into a motel where a murder most foul had taken place...so do the deceased couple, for they're there to recreate the murder or try and reconcile, who can tell. Witty and strange." "The Skins Of The Fathers"